Break noodles into thirds and add to small zipper bag. 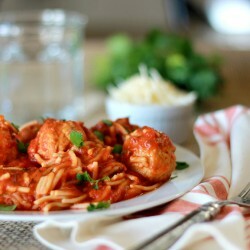 Add meatballs, spaghetti sauce, water and olive oil to slow cooker. Cook on low for 4-6 hours. Add noodles, mix well to make sure noodles are under liquid (add more liquid if needed) and cook on HIGH for 30 minutes-1 hour. Here is the key to success…….all noodles are different. The first time you cook this, you need to check on it and see when noodles are done. Check at 30 minutes to determine if they need more cooking time.